I’m excited to tell you about my brand new single. Hooked On Us, which was just recently released on June 18th National Go Fishing Day and will kick off the summer fishing season! I cowrote this song with Joe Forte in Nashville and recorded with Daniel Dennis at Prime Cut Studio, Nashville TN. Hooked On Us is a flirty and lighthearted track about hooking your perfect catch! A true reflection of my down-home country girl personality, Hooked On Us compares my love of fishing to finding the love of your life. Hooked On Us is a very relatable song as we all go through that journey of searching for our right match, sometimes catching a few duds along the way and tossing them back, or continually reeling in empty until one day that perfect-for-you catch comes along. I love to fish and am proud to say that my biggest fish ever caught myself is a 32.5 lb chinook salmon! I have also caught many more salmon, steelhead, trout and pike. Fishing is definitely something that I love to do, so writing a fishing love song came naturally. 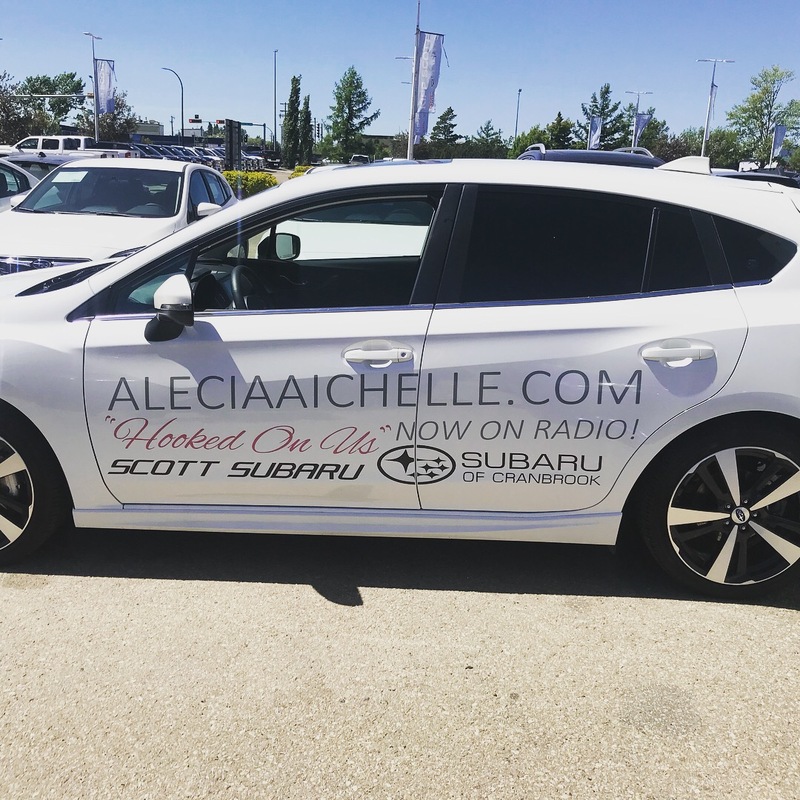 I am also excited to tell you about my vehicle sponsorship from Scott Subaru in Red Deer. 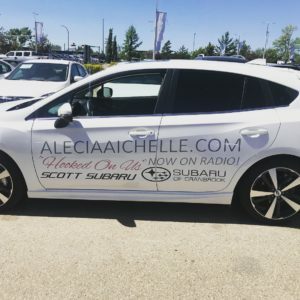 They have logo’d a beautiful 2018 Impreza Hatchback for me to use on my Hooked On Us summer radio tour and shows. I am very honoured and thankful for this opportunity! As many of you know, I lost my sweet boy, Hank my French Bulldog, two weeks ago today. This song was already planned for release, and although it is a fishing love song, I’ve decided to dedicate it to Hank since he was my little fishing buddy and really, my everything buddy! 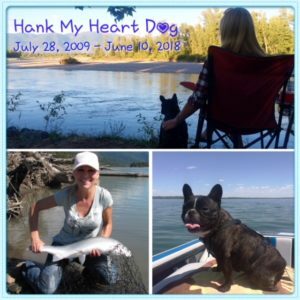 Hank was my special boy who was always by my side. He was my best friend and companion dog through many tough times in my life for 8.5 years. He really was more than a dog to me. He was my heart dog. We had a rare and special bond. Gone too soon and unexpected. He spent nearly 3 weeks in Animal CARE Centre in Calgary and I drove to Calgary to spend time with him daily. I am so thankful for that extra time together in the park everyday, and will forever be grateful for the years I had with him, though it dosn’t seem long enough. As hard as it has been, I know that Hank would want me to continue on and be the best that I can be. 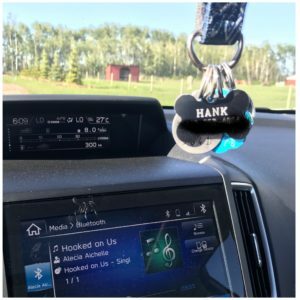 He was supposed to join me on radio tour this summer, and Subaru, being a dog loving brand, was very excited about Hank joining me. I now have Hank’s collar hanging from the rear view mirror as a reminder that he is always with me in my heart. For more on Hank’s and my journey, head over to my Instagram page. Hank, I will carry you forever in my heart, soul, and song until I hold you in heaven. ← Get Gone Radio Tour Nov/Dec 2017!